Papaver somniferum has one accepted subspecies, Papaver somniferum subsp. setigerum (DC.) Arcang. It also has many varieties and cultivars. Colors of the flowers vary widely, as do other physical characteristics, such as number and shape of petals, number of flowers and fruits, number of seeds, color of seeds, and production of opium. Papaver somniferum (sometimes called Papaver paeoniflorum) is a subtype of opium poppy whose flowers are highly double, and are grown in many colors. P. somniferum (sometimes called Papaver laciniatum) is a subtype of opium poppy whose flowers are highly double and deeply lobed. The 'Sujata' cultivar produces no latex, having no utility for opioid production. The DEA raided Thomas Jefferson's Monticello estate in 1987. It removed the poppy plants that had been planted continually there since Jefferson was alive and using opium from them. Employees of the foundation also destroyed gift shop items like shirts depicting the poppy and packets of the heirloom seed. 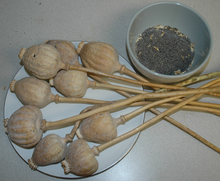 The opium poppy, as its name indicates, is the principal source of opium, the dried latex produced by the seed pods. Opium contains a class of naturally occurring alkaloids known as opiates, that include morphine, thebaine, codeine, papaverine, noscapine and oripavine. The specific epithet somniferum means "sleep-bringing", referring to the sedative properties of some of these opiates. Since "opium poppy and poppy straw" are listed in Schedule II of the United States' Controlled Substances Act, a DEA license may be required to grow poppies in ornamental or display gardens. In fact, the legal status of strictly ornamental poppy gardens is more nuanced. During the summer, opium poppies can be seen flowering in gardens throughout North America and Europe, and displays are found in many private plantings, as well as in public botanical and museum gardens such as United States Botanical Garden, Missouri Botanical Garden, and North Carolina Botanical Garden. In 2016, world production of poppy seeds for consumption was 92,610 tonnes, led by the Czech Republic with 31% of the world total (table). Turkey and Spain were other major producers. World production of poppy seed is increasing, with the highest growth rate in Eastern Europe. However, poppy seed production and trade is susceptible to fluctuations mainly due to unstable yields. The performance of most genotypes of "Papaver somniferum" is very susceptible to environmental changes  This behaviour led to a stagnation of the poppy seed market value between 2008-2009 as a consequence of high stock levels, bad weather and poor quality. The world leading importer of poppy seed is India (16 000 tonnes), followed by Russia, Poland and Germany. The New York Times reported, in 2014, that Tasmania was the largest producer of the poppy cultivars used for thebaine (85% of the world's supply) and oripavine (100% of the world's supply) production. Tasmania also had 25% of the world's opium and codeine production. 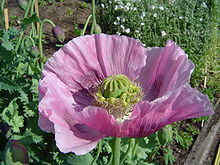 In late 2007, the British government permitted the pharmaceutical company Macfarlan Smith (a Johnson Matthey company, FTSE 100) to cultivate opium poppies in England for medicinal reasons after Macfarlan Smith's primary source, India, decided to increase the price of export opium latex. The Office of Fair Trading has alerted the government to their monopoly position on growing in the UK and worldwide production of diamorphine and recommended consideration. The government's response advocated the status quo, being concerned interference might cause the company to stop production. Mosaic diseases in p. somniferum are caused by rattle virus and the Carlavirus. In 2006, a novel virus tentatively called "opium poppy mosaic virus" (OPMV) from the genus Umbravirus was isolated from p. somniferum containing leaf mosaic and mottling symptoms, in New Zealand. It is increasingly incorrect to call Papaver somniferum the opium poppy, as many varieties do not produce a significant amount of opium. At least one produces no opium at all. That variety, therefore, also cannot be used to create codeine and other drugs from other alkaloids present in Papaver somniferum latex. This breeding has been done for two purposes. The first is to produce ornamental varieties that cannot be used for home or small-scale opium production, such as one called Danish Flag. Danish Flag and other examples of these cultivars are widely available for consumer purchase, unlike varieties that produce opium. The second is to produce cultivars that can only be used to produce other alkaloids. These are grown commercially for the pharmaceutical industry, as are varieties that are bred for high opium production. Varieties that produce large amounts of opium have been bred for the pharmaceutical industry and are not available for consumers to purchase as seed. The rapidly decreasing availability of Papaver somniferum varieties that produce significant quantities of opium has made laws against the growing of such varieties more questionable, as they don't produce the substance that is the basis for the restrictions. ^ a b "Breadseed or opium poppy, Papaver somniferum". University of Wisconsin Extension, Master Gardener Program. Retrieved 7 January 2018. ^ a b c d "Shake-Up on Opium Island". The New York Times. Retrieved 8 January 2018. ^ a b c d Gaevskii, A.V. (1999). "On the intraspecies classification of opium poppy (Papaver somniferum L.)". Khimiko-Farmatsevticheskii Zhurnal. 33 (3): 32–36. doi:10.1007/BF02508453. ^ a b Chaturvedi, Nidarshana (2014). 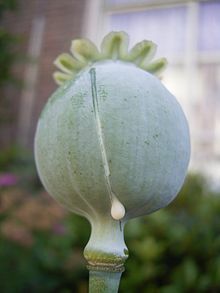 "Latex-less opium poppy: cause for less latex and reduced peduncle strength)" (PDF). Physiologia Plantarum. 150 (3): 436–445. doi:10.1111/ppl.12086. PMID 24033330. Retrieved 7 January 2018. ^ a b Reader's Digest Field Guide to the Wild Flowers of Britain. Reader's Digest. 1981. p. 32. ISBN 9780276002175. ^ a b "Papaver somniferum L. is an accepted name". theplantlist.org. 23 March 2012. Retrieved 1 November 2017. ^ a b c Dittbrenner, A. (2009). "Variability of alkaloid content in Papaver somniferum L". Journal of Applied Botany and Food Quality. 107: 103–107. ^ a b Yadav, Hemant K.; Shukla, S.; Singh, S. P. (16 August 2006). "Genetic Variability and Interrelationship Among Opium and its Alkaloids in Opium Poppy (Papaver Somniferum L.)". Euphytica. 150 (1–2): 207–214. doi:10.1007/s10681-006-9111-x. ISSN 0014-2336. ^ "BSBI Distribution Maps, Papaver somniferum". London, U.K.: Botanical Society of Britain and Ireland. 22 April 2016. ^ "Papaver somniferum L." Copenhagen, Denmark: Global Biodiversity Information Facility, GBIF.org. ^ Askitopoulou, Helen; Ramoutsaki, Ioanna A; Konsolaki, Eleni (2002). "Archaeological evidence on the use of opium in the Minoan world". International Congress Series. 1242: 23–29. doi:10.1016/S0531-5131(02)00769-0. ^ a b "How the DEA Scrubbed Thomas Jefferson's Monticello Poppy Garden from Public Memory". AlterNet. 2 March 2010. Archived from the original on 4 December 2018. Retrieved 7 January 2018. ^ a b c d e Ye, Kai; Graham, Ian A.; Bowser, Tim A.; Lu, Ying; Teodor, Roxana; He, Zhesi; Ning, Zemin; Li, Yi; Yang, Xiaofei (19 October 2018). "The opium poppy genome and morphinan production". Science. 362 (6412): 343–347. doi:10.1126/science.aat4096. ISSN 0036-8075. PMID 30166436. ^ "Mahanandi » Gasagasalu ~ Bendakaaya". Nandyala.org. Retrieved 30 December 2011. ^ "5 Recent Food Bans from Around the World". Times of India. Retrieved 8 January 2018. ^ "Travel Warning - Khas Khas (Poppy Seed) Imprisonment in UAE". Brett M.Christensen. Retrieved 8 January 2018. ^ "Unapproved Drugs, What's the Big Deal?" (PDF). International Journal of Pharmaceutical Compounding, Winter 2006. Retrieved 3 January 2009. ^ "International Narcotics Control Bureau, Technical Reports, 2008, Part IV, Statistical information on narcotic drugs" (PDF). Retrieved 30 December 2011. ^ a b "Poppy seed production in 2016, Crops/Regions/World list/Production Quantity (pick lists)". UN Food and Agriculture Organization, Corporate Statistical Database (FAOSTAT). 2017. Retrieved 18 April 2018. ^ Yadav, H.; Shukla, S.; Singh, S. (2007). "Assessment of genotype × environment interactions for yield and morphine content in opium poppy (Papaver somniferumL.)". Acta Agronomica Hungarica. 55 (3): 331–338. doi:10.1556/AAgr.55.2007.3.9. ^ Procházka, Petr; Smutka, Lubos (30 June 2012). 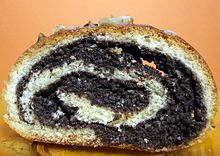 "Czech Republic as an Important Producer of Poppy Seed". AGRIS On-line Papers in Economics and Informatics. 4 (2): 35–47. Retrieved 15 November 2018. ^ Sergeeva, Anna. "Global Poppy Seed Market – The Czech Republic Is the Key Producing Country". Index Box. Index Box. Retrieved 15 November 2018. ^ Frick, Claudia; Hebeisen, Thomas (2005). "Mohn als alternative Ölpflanze". AGRARForschung. 12 (1): 4–9. ^ Dicker, Jason. "The Poppy Industry in Tasmania". University of Tasmania. Retrieved 2 September 2009. ^ Braund, Claire (2001). "Research driving the Tasmanian poppy industry". Australian Society of Agronomy. Archived from the original on 29 July 2009. Retrieved 2 September 2009. ^ "Poppy for Medicine". Poppy for Medicine. Retrieved 2 September 2009. ^ a b "Review of undertakings by Macfarlan Smith Limited". Department for Business, Innovation and Skills. March 2006. Archived from the original on 22 November 2008. Retrieved 2 September 2009. ^ "Opium derivatives - Government response to OFT review of undertakings by Macfarlan Smith Limited (MSL)" (PDF). Department for Business, Innovation and Skills. March 2006. Archived from the original (PDF) on 4 December 2009. Retrieved 3 October 2012. ^ Mahdavi-Damghani, Abdolmajid; Kamkar, Behnam; Al-Ahmadi, Majid Jami; Testi, Luca; Muñoz-Ledesma, Francisco J.; Villalobos, Francisco J. (October 2010). "Water stress effects on growth, development and yield of opium poppy (Papaver somniferum L.)". Agricultural Water Management. 97 (10): 1582–1590. doi:10.1016/j.agwat.2010.05.011. hdl:10261/94915. ISSN 0378-3774. ^ a b Gaur, B. L.; Gupta, P. C.; Sharma, D. D. (January 1986). "Weed management in opium poppyPapaver somniferumL". Tropical Pest Management. 32 (4): 267–268. doi:10.1080/09670878609371076. ISSN 0143-6147. ^ a b c Pinke, Gyula; Tóth, Kálmán; Kovács, Attila J.; Milics, Gábor; Varga, Zoltán; Blazsek, Katinka; Gál, Katalin E.; Botta-Dukát, Zoltán (3 July 2014). "Use of mesotrione and tembotrione herbicides for post-emergence weed control in alkaloid poppy (Papaver somniferum)". International Journal of Pest Management. 60 (3): 187–195. doi:10.1080/09670874.2014.953622. ISSN 0967-0874. ^ a b c d PINKE, G; PÁL, R W; TÓTH, K; KARÁCSONY, P; CZÚCZ, B; BOTTA-DUKÁT, Z (16 September 2011). "Weed vegetation of poppy (Papaver somniferum) fields in Hungary: effects of management and environmental factors on species composition". Weed Research. 51 (6): 621–630. doi:10.1111/j.1365-3180.2011.00885.x. ISSN 0043-1737. ^ a b Singh, Akanksha; Gupta, Rupali; Saikia, Shilpi K.; Pant, Aakanksha; Pandey, Rakesh (December 2016). "Diseases of medicinal and aromatic plants, their biological impact and management". Plant Genetic Resources. 14 (4): 370–383. doi:10.1017/S1479262116000307. ISSN 1479-2621. ^ Voglmayr, Hermann; Montes-Borrego, Miguel; Landa, Blanca B. (7 May 2014). "Disentangling Peronospora on Papaver: Phylogenetics, Taxonomy, Nomenclature and Host Range of Downy Mildew of Opium Poppy (Papaver somniferum) and Related Species". PLoS ONE. 9 (5): e96838. doi:10.1371/journal.pone.0096838. ISSN 1932-6203. PMC 4013089. PMID 24806292. ^ Bajpai, S.; Gupta, M. M.; Kumar, S. (September 1999). "Identification of Indian Landraces of Opium Poppy Papaver somniferum Resistant to Damping-off and Downy Mildew Fungal Diseases". Journal of Phytopathology. 147 (9): 535–538. doi:10.1046/j.1439-0434.1999.147009535.x. ISSN 0931-1785. ^ Barnawal, D.; Pandey, S.S.; Bharti, N.; Pandey, A.; Ray, T.; Singh, S.; Chanotiya, C.S. ; Kalra, A. (3 April 2017). "ACC deaminase-containing plant growth-promoting rhizobacteria protect Papaver somniferum from downy mildew". Journal of Applied Microbiology. 122 (5): 1286–1298. doi:10.1111/jam.13417. ISSN 1364-5072. ^ Thangavel, T.; Wilson, C. R.; Jones, S.; Scott, J. B.; Voglmayr, H. (February 2017). "First Report of Systemic Downy Mildew of Opium Poppy Caused by Peronospora somniferi in Australia". Plant Disease. 101 (2): 392. doi:10.1094/pdis-06-16-0796-pdn. ISSN 0191-2917. ^ Tang, Joe; Lebas, Bénédicte; Liefting, Lia; Veerakone, Stella; Wei, Ting; Ward, Lisa (29 October 2015). "Opium poppy mosaic virus, a new umbravirus isolated from Papaver somniferum in New Zealand". Archives of Virology. 161 (1): 197–201. doi:10.1007/s00705-015-2651-4. ISSN 0304-8608. PMID 26514844. ^ Bečka, D.; Cihlář, P.; Vlažný, P.; Pazderů, K.; Vašák, J. (3 October 2014). "Poppy root weevils (Stenocarus ruficornis, Stephens 1831) control in opium poppy (Papaver somniferum L.)". Plant, Soil and Environment. 60 (10): 470–474. doi:10.17221/417/2014-pse. ISSN 1214-1178. ^ "Authorized Sources of Narcotic Raw Materials, 21 CFR Part 1312; Docket No. DEA-282F, RIN 1117-AB03". Drug Enforcement Administration, US Department of Justice. 2008. Retrieved 13 September 2017. ^ "Bulletin on Narcotics – 1950 Issue 3 – 002". UNODC. Retrieved 30 December 2011. ^ "Controlled Substances Import and Export Act". US Food and Drug Administration. Retrieved 30 December 2011. ^ "21 U.S.C. § 188 : US Code – Section 188 TO 188N: Repealed. Pub. L. 91-513, title III, Sec. 1101(a)(7), Oct. 27, 1970, 84 Stat. 1292". Codes.lp.findlaw.com. Retrieved 30 December 2011. ^ Harry J. Anslinger (1959). "The traffic in narcotic drugs: The implementation of treaty obligations in regulating the traffic in narcotic drugs" (PDF). The American University Law Review. 8: 112–116. ^ Young, David (September 1952). "The international control of narcotic drugs". American Bar Association Journal. 38: 778–80. ^ "Poppin' Up Poppies". Texasgardener.com. Retrieved 30 December 2011. ^ "United States Code: Title 21,188 to 188n. Repealed. Pub. L. 91–513, title III, 1101(a)(7), Oct. 27, 1970, 84 Stat. 1292 | LII / Legal Information Institute". Law.cornell.edu. Retrieved 30 December 2011. ^ "21 USC Chapter 6 – Narcotic Drugs 01/03/2007". Joffelaw.com. Retrieved 30 December 2011. ^ "Controlled Drugs and Substances Act 1996". Justice Laws Website, Government of Canada. 4 April 2018. Retrieved 20 June 2018. ^ "Poppy Regulation Act". Department of Primary Industry and Resources, Northern Territory Government, Australia. 2016. ^ Section 9(4) of the Misuse of Drugs Act states, "It shall be a defense to a charge under subsection (1) [Cultivation of prohibited plants] if the person charged proves that the prohibited plant to which the charge relates was of the species Papaver somniferum, and that it was not intended to be a source of any controlled drug or that it was not being developed as a strain from which a controlled drug could be produced." "New Zealand Legislation: Misuse of Drugs Act 1975". Retrieved 7 July 2012. ^ McGrath, Ginny (8 February 2008). "Travellers who 'smuggle' poppy seeds face Dubai jail". The Times. UK. Retrieved 2 September 2009. This page was last edited on 25 April 2019, at 14:56 (UTC).